War always causes a rise in prices. 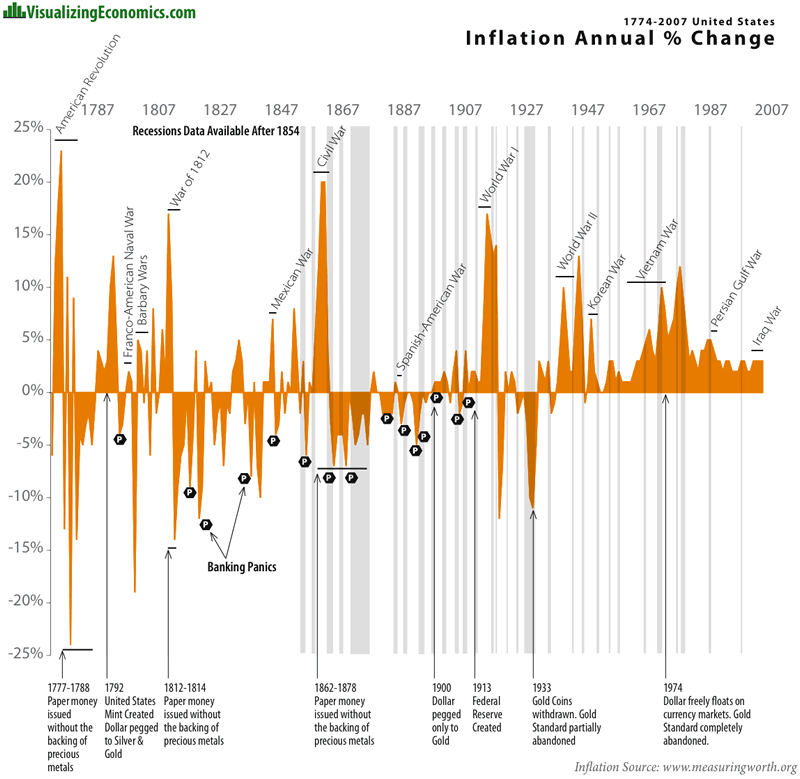 "Every major war in the past century brought inflation to some degree. And so did two upheavals in the Middle East, the Yom Kippur War of 1973 and the Iranian Revolution of 1979, which did not directly involve the United States, except through their effect on the price of oil. Why is this so? The big reason is that wars must be paid for, somehow. They require resources that civilians would otherwise use. Those resources must be diverted to the war effort. Usually, inflation is the easiest way. World War I was largely financed by inflation, and so were the Revolutionary and Civil Wars before that. So, though on a smaller scale, was Vietnam. 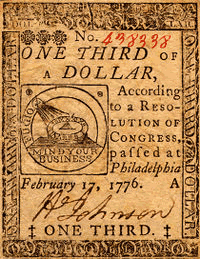 The American Colonies lacked the necessary finances to rebel against Britain - instead of raising money through taxation they decided to print a "Continental Currency". Unfortunately for the Colonies their new currency was easily counterfeited. And Britain did so, counterfeiting large amounts and giving it away to destroy its value. Between the combination of counterfeits and increased continental printing the value of the colonies paper currency became worth 1/1,000th of its original face value by the end of the war. The saying "not worth a continental" was a result of this massive devaluation. The Civil War's direct cost was $6.7 billion in 1860 money - over $140 billion in today's. Worldwide military spending edged up in 2010, to a record $1.6 trillion, the Stockholm International Peace Research Institute said in April 2011. Spending in Europe shrank 2.8 percent to $382 billion, the biggest cuts were in small economies in central and eastern Europe, and in countries such as crisis stricken Greece. The Unites States increased spending, in 2010, by 2.8 percent to $698 billion - six times as much as China spent for defense spending. Not included in US numbers are nuclear weapons spending, black ops, interest on the defense portion of the debt and ongoing military obligations to veterans. The budget for nuclear weapons falls under the Department of Energy, other military expenses - care for veterans, health care, military training, aid and secret operations - are put under other departments or are accounted for separately. The US numbers are already eye opening - they amount to more than half of all government discretionary spending and represent, at the very least, an astounding 43% of total military spending on the planet. US Defense spending in 2011 is slated to increase, by a reported $5 billion over 2010 levels. "The United States has increased its military spending by 81 percent since 2001. At 4.8 percent of gross domestic product, U.S. military spending in 2010 represents the largest economic burden outside the Middle East." SIPRI Military Expenditure Project chief Sam Perlo-Freeman. "Congress and the Federal Reserve Bank have a cozy, unspoken arrangement that makes war easier to finance. Congress has an insatiable appetite for new spending, but raising taxes is politically unpopular. The Federal Reserve, however, is happy to accommodate deficit spending by creating new money through the Treasury Department. In exchange, Congress leaves the Fed alone to operate free of pesky oversight and free of political scrutiny. Monetary policy is utterly ignored in Washington, even though the Federal Reserve system is a creation of Congress. Sun Tzu said to keep your wars short and have the money in hand before assembling an army. Inflation acts as an indirect tax on an economy. Perhaps the US Congress should consider Sun Tzu's advice? At any rate, inflation should be on every investors radar screen. Is it on yours?